Greek guitar virtuoso Gus G., well known in rock and metal circles for his work as Ozzy Osbourne's guitarist and as leader of his own band FIREWIND, has released a guitar playthrough video for his song "Thrill Of The Chase". 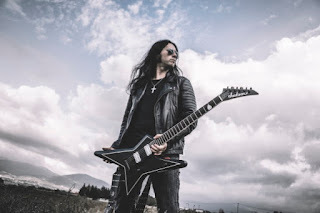 The track is taken from his latest solo album, "Fearless", whch was released on April 20 via AFM Records. The follow-up to 2015's "Brand New Revolution" marks Gus's first release since exiting Osbourne's band in 2017. Said Gus: "'Thrill Of The Chase' is the second instrumental on this record. This is a song that showcases, obviously, a lot of my guitar playing. And it's also a tribute to a lot of my guitar heroes from the '80s and '70s. It's got a heavy, I would say, Michael Schenker and SCORPIONS influence, and, obviously, a lot of the '80s shredders that I grew up listening to — the Mike Varney guitar scene. So I just wanted to create a track that takes you back to that time."